C200 Contact Wheels utilize aluminum flanges to reduce a 3-1/2″ pilot hole to the required bore size. With the flanges assembled, the wheel has an 1-1/4″ length through the bore making it adaptable to shorter than usual spindles. Both wheels and flanges are dynamically balanced independently for smooth operation. Wheels and flanges may be used interchangeably with products of the same design from other manufacturers. 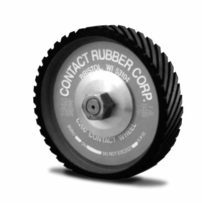 Wheels are made of a heavy-gauge steel core with rubber molded to the diameter. Rubber densities range from 20 to 95 durometers with a plain or serrated face. Standard diameters are 12″ and 14″ with face widths from 1″ to 4″ in 1/2″ increments. C-200’s are available with Soft Grind™ foam covering.